Today's Draw: The Four of Swords from the Animalis Os Fortuna deck in the Crossing What is Hidden position from the Deck of 1000 Spreads. Do you believe you know more than you know? Where do you think this information comes from? How do you access the information locked away within? There's a theme forming this week and it's about how much higher the potential of our divine self is than we give it credit for. Monday we spoke of pushing farther on spiritual paths. Tuesday was about our ability to define and commune with God. And today is about the sheer breadth of knowledge we hold within. This combo literally says that meditation crosses that which is hidden. So in that meditative or subconscious state, we intersect with the things that are hidden from us in our conscious state. The artist has chosen a chicken sitting on its eggs to illustrate the traditional card of rest and meditation. 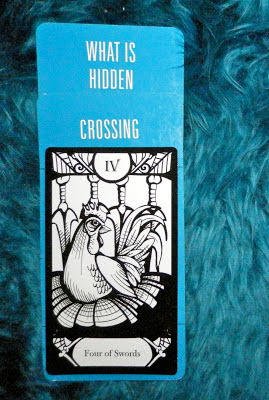 So there's an element of patience in this card, too...of waiting for the right time for the eggs (or answers) to hatch. That's what things are like when we go inside to access our higher self. It's not like the answer is in there with a starburst and flashing lights all around it. Sometimes you have to ease it out. First, let's back up a little. I see our "higher selves" as that part of us that's connected to the "all that is". So somewhere inside of us, we have all the answers. That's why we can look within and find god. It's why we get psychic flashes. It's why we "just know" things we have no reason to know. So we've got this direct line to the library of all that is and ever will be, but it's not a clear connection. And sometimes calls don't go through. And sometimes there's static on the line. But the connection is there. We're just not adept at using it yet. Actually, I sort of suspect there was a time when we were much better at using it, but all of that got smothered out by larger egos. Someone started telling us what to know, so we stopped looking to ourselves. It's like I was talking about yesterday with "who god is". Someone told us a long time ago and we forgot that we're just as capable of finding out for ourselves, so we just follow along like sheep instead. So much of what we take for knowledge is habitual repetition of something someone told us a long time ago. And some of it is legitimate. Geography, science, grammar...all great things to learn from others. But science is only the science of things that can be proven. There's still so much out there that hasn't been proven, yet is still real. Like energy medicine, for example. They can't prove we can transmit energy between us, but that doesn't mean it's not real. And grammar...don't even get me started. Proper grammar is a great guideline and should be learned, but it's not the only way to communicate. And who decided it was improper to end a sentence with a preposition, anyway? Swinging back to the topic at hand, meditation, rest, patience....all of those are ways to access those things that are hidden from us. For me, showering is also good. It seems like I get in that shower and all sorts of ideas come to me. Driving also works. Doing these automatic or repetitive things is a form of meditation, or at least works the same way. One of the techniques I use is the "gut check". I get into a relaxed state and make a statement like "my dogs will be fine while I'm gone from the house". (I'm always worried that they won't be.) Then as I exhale, I make that statement and see how it feels in my gut. If it feels peaceful in my gut, then the dogs will be fine. If there's anxiety in my gut, then I'll probably come home to barf on the carpet or something. I do this will all manner of topics and it usually proves accurate. So think about how you can access this place of inner knowing. Is it through formal meditation? Through intentional dreaming? Through divination? Through gut checks? What would work for you? Then start working with it and honing it. The longer you work it, the clearer your connection gets. I am the artist of the Animalis Os Fortuna deck (the chicken card) and you have one amazing talent here! Your post was so insightful! Thank you for sharing my deck but also your wisdom, I'm excited to read more of your posts!